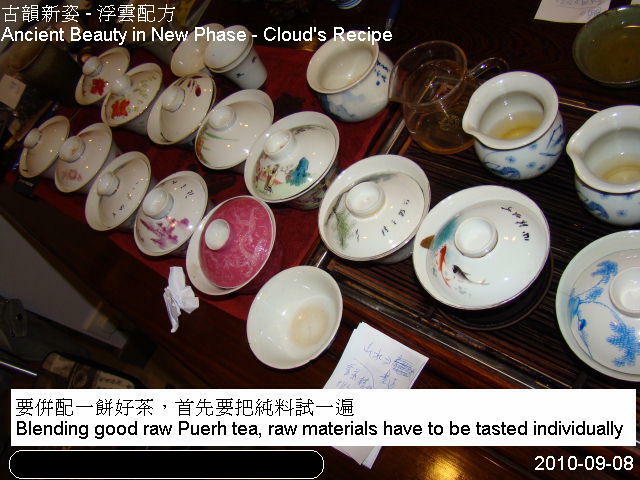 In August 2010, an investor friend of Cloud's dropped by and tried to understand the investment value of raw Puerh tea. 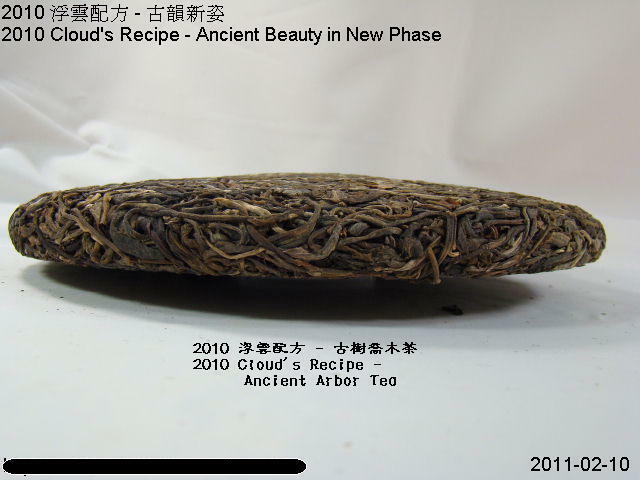 Cloud mentioned that the value appreciation of raw Puerh tea was related to aging years and, most importantly, good raw materials. 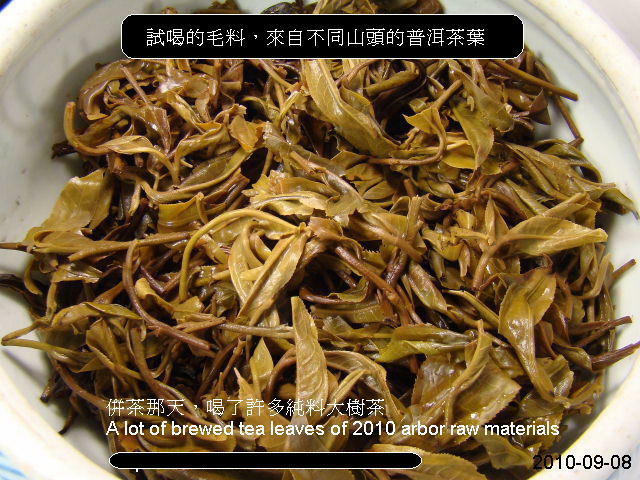 Although the arbor tea leaves are quite expensive these days, they will bring fairly good investment return as long as they can age into goodies. Living with ultimate low interest rate today, Cloud's investor friend suddenly had a thought in mind and asked, "Can you blend a piece of good arbor tree tea cake?" 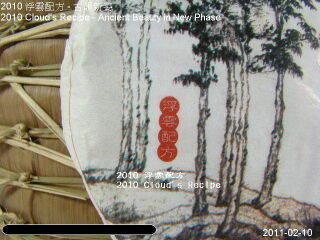 Of course, it is not a difficult task for Cloud to blend those good tea cakes. However, it's a pity and just for personal fun if the blended recipe would not have been mass produced. After a few minutes deep thought, unexpectedly, investor friend was serious to that idea. 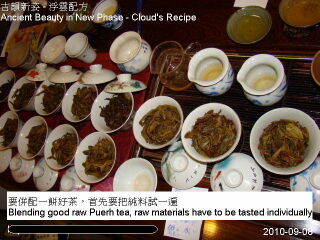 He expressed that he was willing to invest so long as the raw Puerh recipe was good enough to provide future return. It would not be a problem for him to store the tea for decades. With the help of Cloud's investor friend, Cloud's Recipe has been realized. 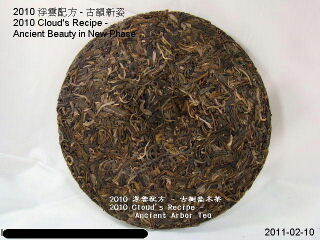 Cloud's Recipe is the blending recipe of arbor tea leaves. The recipe (or formula) was absolutely determined by Cloud, but the specifications, wrapping designs and production details were determined by Cloud's investor friend. Therefore, Cloud's Recipe is different from Cloud's Raw Puerh. 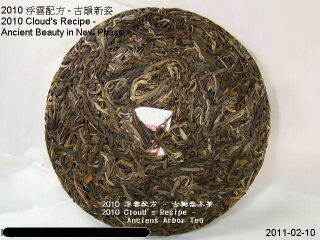 The latter is mainly blended by modern planted tea or ecological tea. 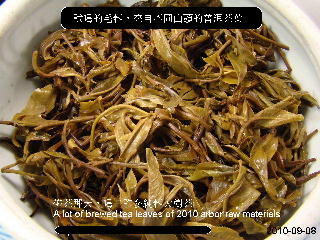 The production of arbor tea cakes requiring investor(s) is due to the huge costs of arbor tea leaves these days. It might be a decade investment without any leverage. 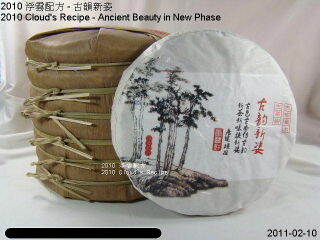 Since this batch of tea cakes was the order of investor, the major collector is obviously the Cloud's investor friend. Many tea lovers ask, "Single blend or multiple blends, which one is better?" 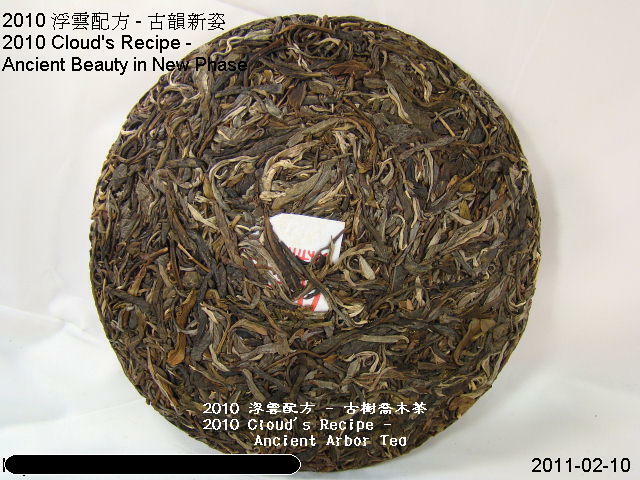 What you have to know is that tea leaves grown from different mountains have their own characteristics. 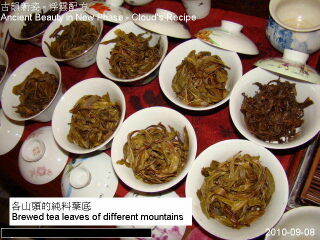 Tea leaves from certain mountains provide good aroma. Some are major in water quality. Some are good at aftertaste and some may contain necessary bitterness and astringency. 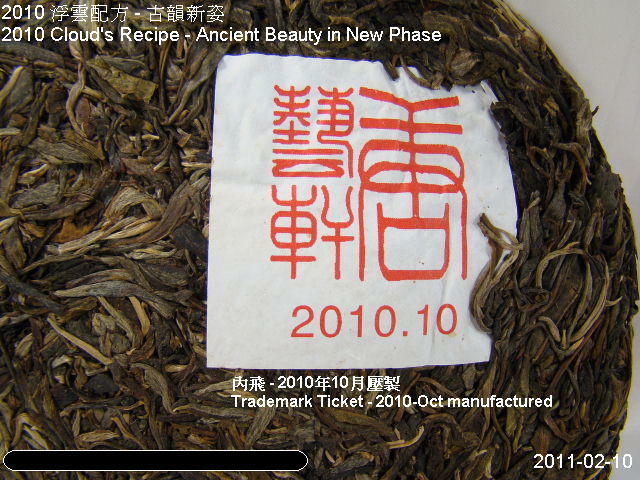 In fact, it is possible to have all these good tea characters in a single blend tea leaves. But it is just not economically feasible. Such raw tea materials must be outrageously expensive and without satisfactory quantity for huge market demands. Usually, these ultimate perfect raw tea materials are just enough for compressing a thousand numbers of tea cakes which are far less than the quantity demanded by the markets. 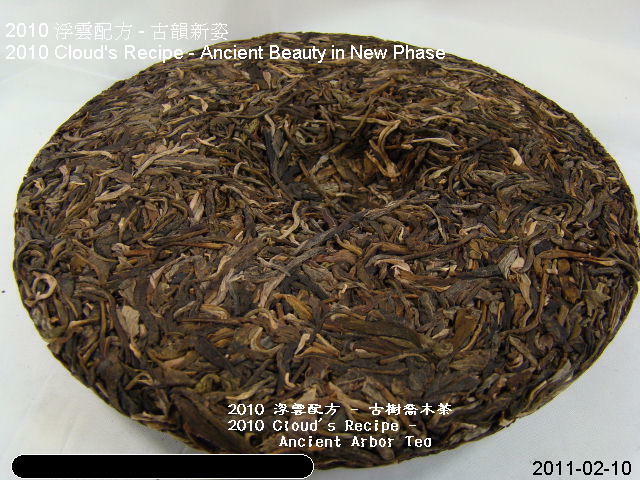 The advantage of a blended tea cake is to enlarge the good characteristics of tea leaves from individual mountain and reduce certain drawback by an appropriate blending ratio of each individual raw materials. This needs experience. A well blended tea cake will showcase its rich, tasty and marvelous tea broth sensation and aftertaste. This is the beauty of tea blending. P.S. The incorrect Chinese character "猛" (Meng) was used because some old Chinese Windows did not display the correct Chinese character "孟力" (Meng) accordingly. 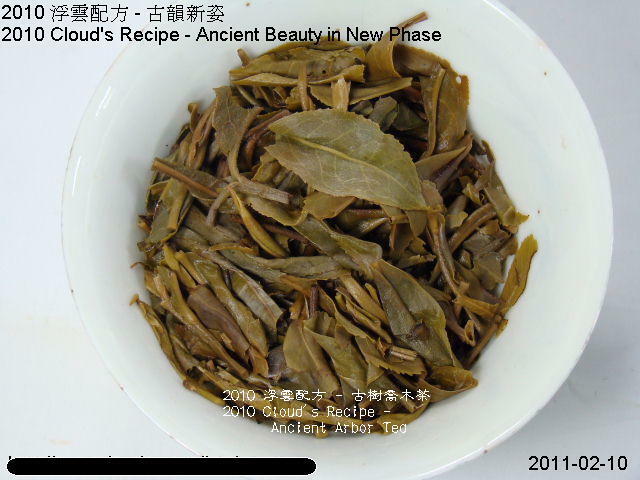 Luo Shuidong(落水洞): Good water quality, sweet, thick tea broth, but weak aroma. Zhangjia Wan(張家灣): Sweet and smooth, but a little bit weak in aroma. Manlong(曼龍): Thick taste, well balanced, tasty. Bangpen(邦盆): Some bitterness, thick quality, quite balanced, but aroma being too green. 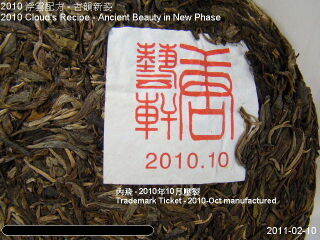 Mahei(麻黑): Good aroma, thick tea broth and sweet, but high costs and limited supply of raw materials. 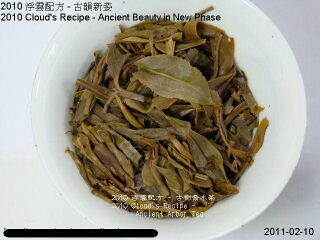 Manzhuan(蠻磚): Green aroma with arbor taste, but a little bit weak for aftertaste. 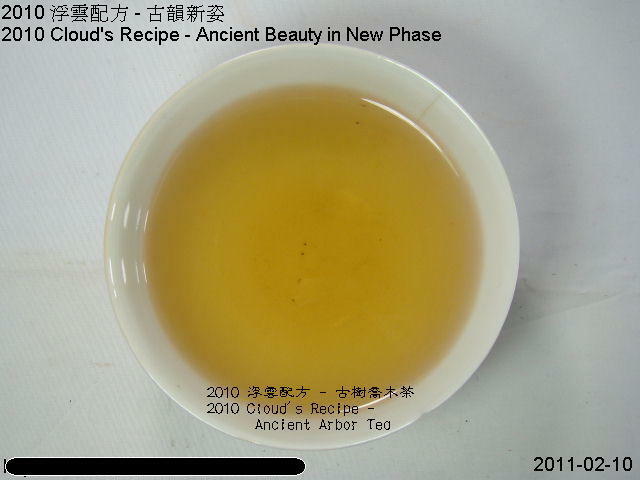 On that day, investor and Cloud tasted and drank a lot of 2010 raw arbor tea materials. After a series of trial brews and fine tuning, we finally decided the blending. After the task was completed, a very aged Puerh tea had to be brewed for comforting our tired tongues and stomach. This tea is blended from the above stated 6 different arbor tea leaves from different mountains according to an appropriate blending ratio. 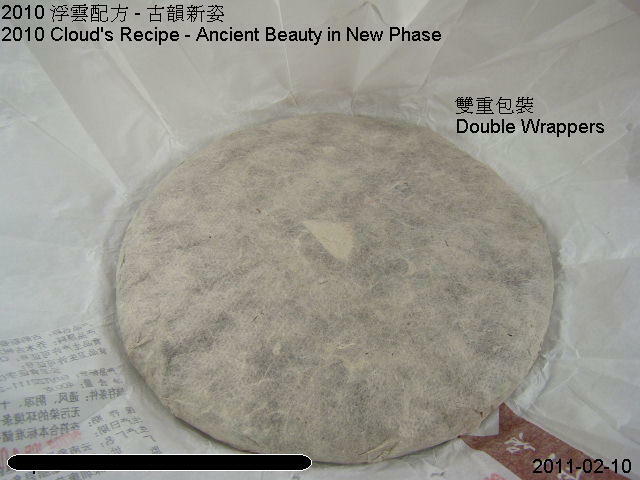 Cloud's investor friend names the tea as Ancient Beauty in New Phase (古韻新姿) which means "new wrapper styles with modern blending technique resulting a good Puerh tea cake for today and tomorrow". Description ticket (A1736) explains in Chinese that "... all these tasty arbor tea materials are from famous tea mountains of Yunnan. 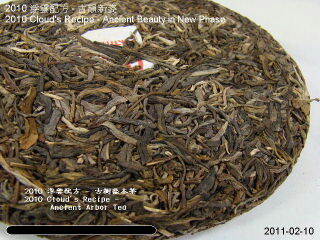 Now, a friend and Cloud blend them together and get the recipe. 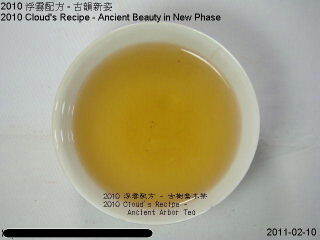 The tea showcases golden tea broth with well balanced aftertaste and strong feelings. The aftertaste is long-lasting. This tea is named as Ancient Beauty in New Phase (古韻新姿) for its uniqueness. It is a tea to be shared with tea lovers." 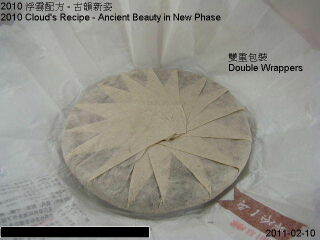 Investor friend got the idea from the wrapping style of Antique Puerh Vintage. He demanded for using 6 pieces of bamboo thread to tie up the entire stack. This makes the whole stack so strong and tidy that it will not get loosened easily in the coming long-term storage. 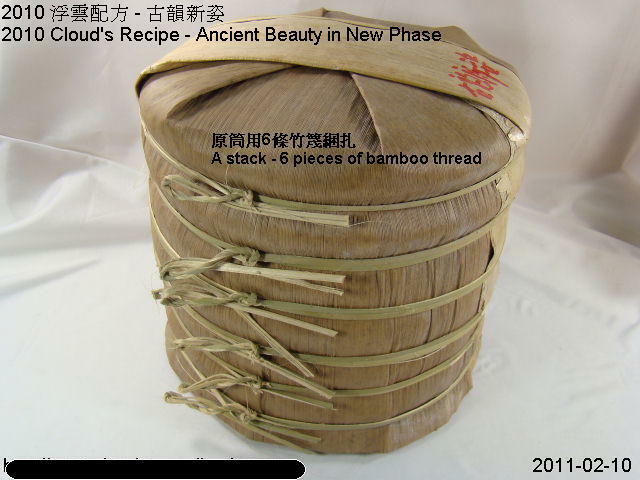 The tying knots of bamboo thread, referring to the Antique Puerh Vintage, are so beautiful. 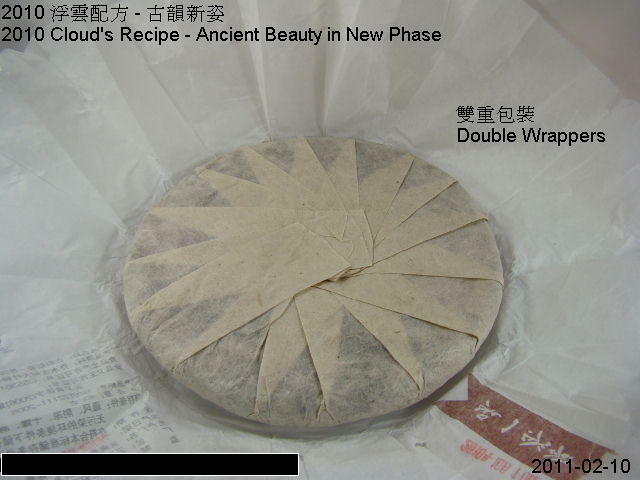 In order to ensure the tea cakes not being exposing to excessive water contents from the air during the long-term aging progress, double wrappers are requested by the investor no matter how much it costs. What's a perfection without concerning the costs! This tea cake is compressed by traditional stone mold, which can be noticed from the edge of tea cake, being round and thick (A1743). A trademark ticket printed with the month of manufacture "2010.10" (A1738) is also embedded into the tea cake so that it will become the concrete evidence of the aging year in the future. 2010 Cloud's Recipe - Ancient Beauty in New Phase has clear and elegant aroma. It tastes sweet, thick and long-lasting. Sweetness is one of the major aroma characteristics. Although some individual raw materials do have weak aroma, raw materials from other areas supplement to that insufficiency so that the overall aroma is good enough for appreciation (both sensations and value). This is the core spirit of blending. The tea broth shows light golden color (A1744). If it is brewed and appreciated at this moment, you will find the silkiness, smoothness and thickness of this arbor tea broth. 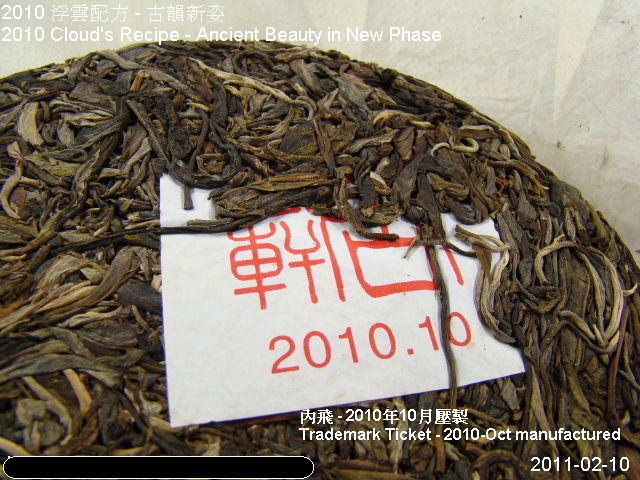 These great sensations are from the Yiwu raw materials (i.e. 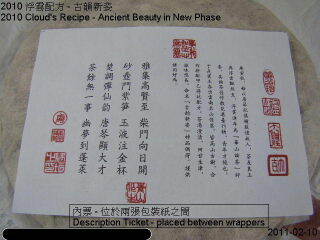 Luo Shuidong(落水洞), Zhangjia Wan(張家灣) and Mahei(麻黑)). 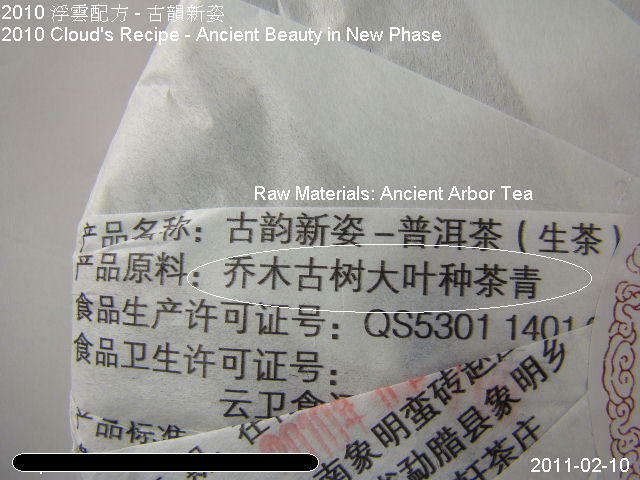 Apart from the thickness, you can also find out the little bitterness in the tea broth (contributed by Bangpen(邦盆) raw materials). By blending these arbor tea raw materials by certain appropriate ratio, it will result a tea broth full of rich and thick tastes. If you taste it gently, you may also notice a little bit slight olive smell and taste inside (this may be the result from the complex multiple blend and definitely not from any single raw material). That's why blending involves certain techniques, which make the tea eventually smooth and elegant. After drinking a sip of this, refreshment with pleasure will follow instantly together with the fantastic cool aftertaste, very long-lasting indeed. 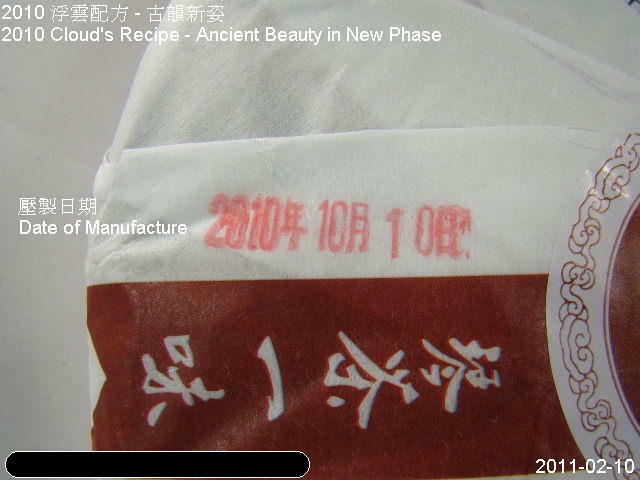 Although the whole batch of tea has been shipped to Hong Kong in January 2011, the tea cakes had to be stabilized in the warehouse for letting the slight water contents to be "evacuating" by putting them in a relatively dry place. After several random tasting of tea cakes from different stacks and confirming the tea quality being consistent, the mission is finally accomplished. In order to make good tea cakes, timing is important. Good raw materials, huge finance, technique and patience, lacking one of them will fail the mission. Most importantly, the tea cake must also be affordable to general tea lovers. Therefore, even though Cloud has self-interest in this tea, Cloud still says, "It is NOT a regular or ordinary blend and product." The blend is so good that Cloud's investor friend loves it so much. Although there are more than 2,000 tea cakes of this batch, Cloud's investor friend originally intended to hoard the entire quantity for several years because he loves the recipe so much. However, Cloud advised that a small quantity of this batch should be released to the market for those tea lovers who were willing to storage their tea cakes on their own. Moreover, it was also a good chance to let tea lovers konw that how good the taste was at the very beginning. Cloud's investor friend agreed. As a reuslt, he was willing to share 100 tea cakes for those who might love this tea. Redemption Details: Any purchase at Cloud's Tea House Shop (Tsuen Wan, HK) up to HK$4,980 (after discount, wholesale price and the value of the product to be redeemed are excluded), customers can redeem ONE tea cake by the special redemption price at HK$1,111. Redemption Details: Any purchase at Cloud's Tea House Shop (Tsuen Wan, HK) up to HK$3,980 (after discount, wholesale price and the value of the product to be redeemed are excluded), customers can redeem ONE tea cake by the special redemption price at HK$1,680.